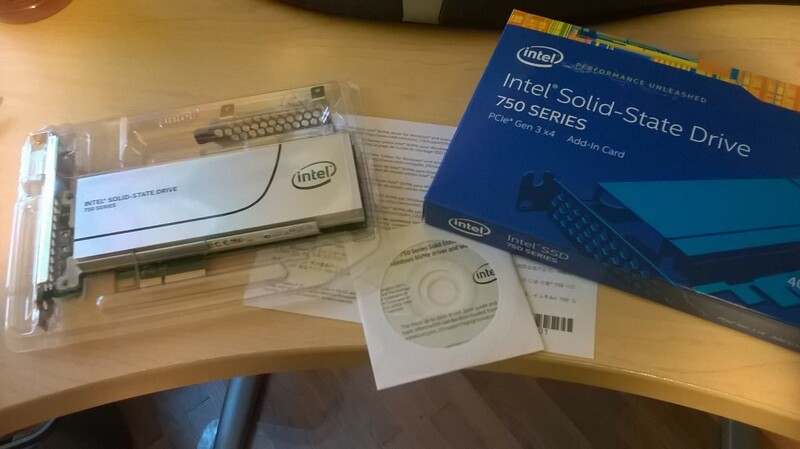 Got a new toy for the build lab: a new Intel 750 Series SSD, prices were fairly reasonable about 1$/GB, as compared to more recent SATA SSD drives at $.50/GB. Performance wise it should be much faster than my standard SATA SSD drives. I was a little surprised to see that the retail package included a DVD, I still have a workstation machine with a DVD reader, but the drivers were already on Windows Update, so the disk was not necessary. I plugged it into my lab build machine with an ASUS Motherboard, and a Z87 chipset. At first, the drive wasn’t detected, so I upgraded the uEFI firmware and that got it working. <whew!> I wasn’t interested in purchasing a new Motherboard, so that was a close call. I re-ran my reference Hydration System building out 9 WIM images for x86,x64,Server versions of Windows 6.1 (Win7), 6.3 (Win8.1), and 10.